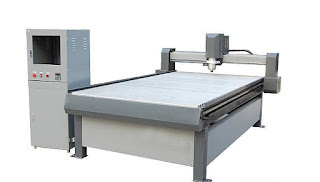 Generally speaking the price cheap woodworking CNC Routers for electromagnetic interference resistance ability is poor, so how to avoid the electromagnetic interference into some manufacturers of the most headache problem. Recently some customer consultation to buy other manufacturers of woodworking CNC Routers appear electromagnetic interference problem, which should be how to solve? Company technicians test found stepper motor and drive housing without the use of aluminum, titanium, magnesium alloy shell are magnetically shielded, so for high sensitive receiving system cause interference, so that it can not work, and the pollution of power, resulting in control system of SCM and PC to communicate, serious will caused by single chip computer crashes, resulting in normal use. 1 the installation of power filter to reduce the pollution of the AC power supply. 2 use the shield to reduce the external interference to the outside world. 3 requires good grounding. One point grounding principle, power supply filter, a driver PE to (drive and chassis backplane insulating) control pulse PULSE- and direction of pulse DIR- short circuit lead wire, the machine is connected to the ground, drive and the motor cable protective sleeve, drive shielded wire are connected to the ground column wall cabinet. 4 prevent crossing. For example, in a biaxial drive system in the two in the same machine woodworking engraving chassis drive device position, as far as possible to increase the control line and power line (LN motor drive line (UVW). Woodworking CNC Routers drive a nameplate forward, another is backward, and the structural layout is the lead as short as possible.